Quidditch is a mixed gender, full contact, high-intensity sport inspired by the fictitious sport of Quidditch in JK Rowling’s fantasy series Harry Potter. Quidditch was first adapted to real-world play in 2005 by students of Middlebury College, Vermont, in the USA. From there it quickly spread with the first major tournament being held between Middlebury and Vassar colleges in 2007. Teams continued to sprout up across the country over the next five years. By 2010, there were 46 teams competing in the national US quidditch cup, then called the World Cup. 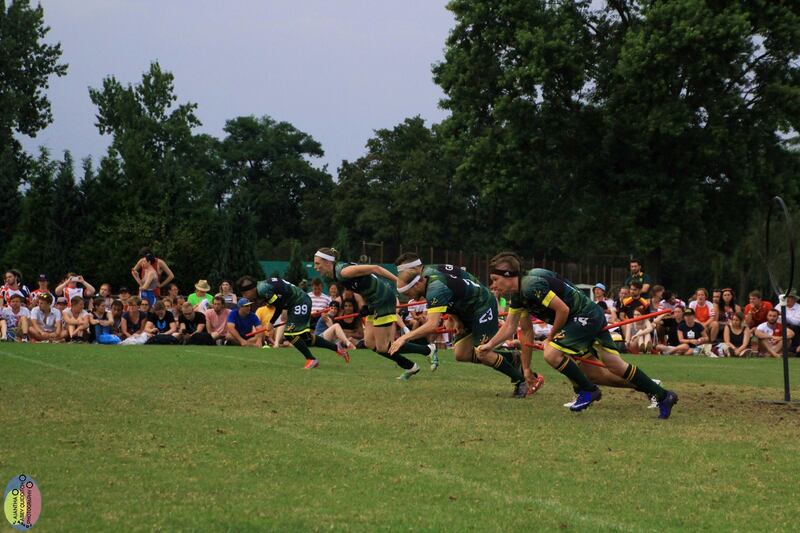 In 2011, the Australian Quidditch Association organised the first major tournament outside the US – The QUAFL Cup. The first major international tournament occurred in 2012 with five countries competing. Today, there are 26 recognised national governing bodies coordinating over 400 teams and over 7,000 players worldwide. Quidditch is played with two sides of 21 athletes, four positions, and five balls. Played on a field about half the size of a soccer pitch, six or seven athletes take the field for each team at a time. Teams consist of one keeper, three chasers, and two beaters. Additionally, after 18 minutes of game time has elapsed, the snitch is released and each team also gains one seeker. The game is played with all players mounted on broomsticks. Keepers and chasers must work together to score goals, each worth 10 points, by throwing the quaffle – a slightly deflated volleyball – through any of three large hoops. Beaters aim to assist their team and disrupt the opposition by using any of the three bludgers – dodgeballs – to “knock out” opposing players, forcing them temporarily out of play. While seekers must aim to catch the golden snitch – a tag velcro-attached to the back of a special referee or “snitch runner”- which ends the game and awards the catching team 30 points. The team with the most points when the snitch is caught, wins the game. Quidditch is a full-contact tackle sport. The sport of quidditch is regulated by the International Quidditch Association, who maintain the official rulebook. Additionally, an abridged version of the rulebook has been written for those seeking a summarised explanation of the main gameplay elements.